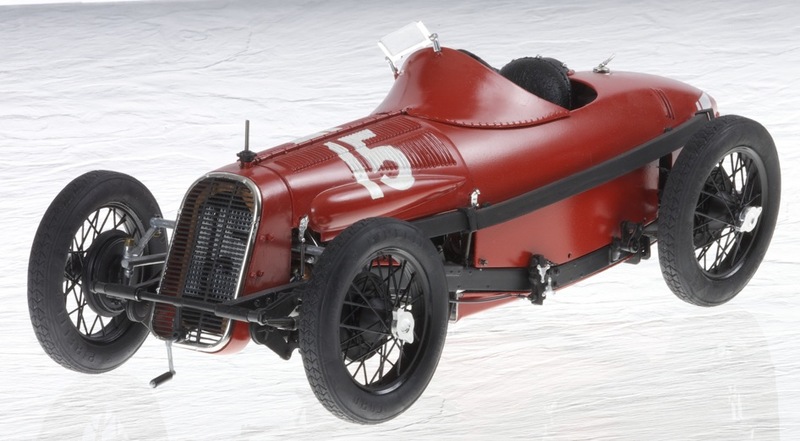 This model built in 1990, represents that driven by Pietro Bordino in the 1927 Grand Prix of Italy at Monza (Grand Premio di Milano). 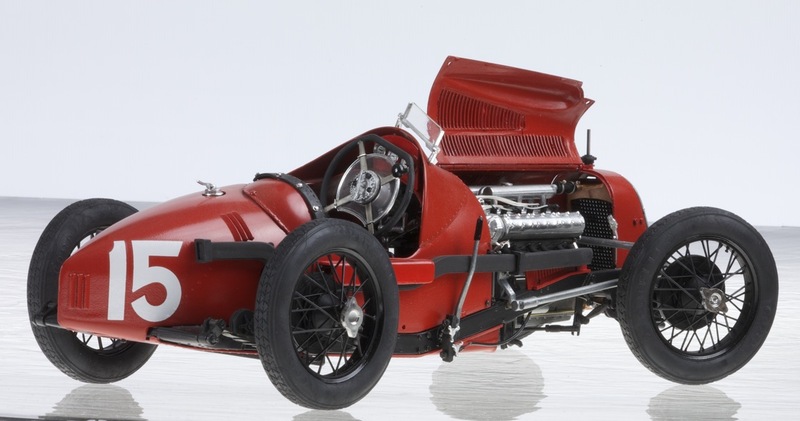 Developing 187bhp from twelve cylinders and with a top speed of 250kph, this was the most powerful Grand Prix car at the time. 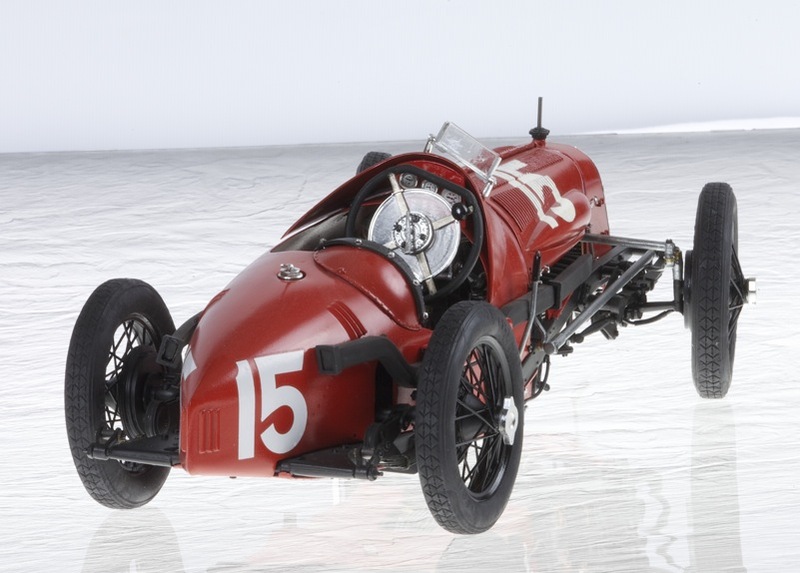 Racing in 1926/27, the 1.5 litre formula was stipulated (having been larger engined cars previously), with a minimum weight enforced (600kg in 1926 and then 700kg in 1927). 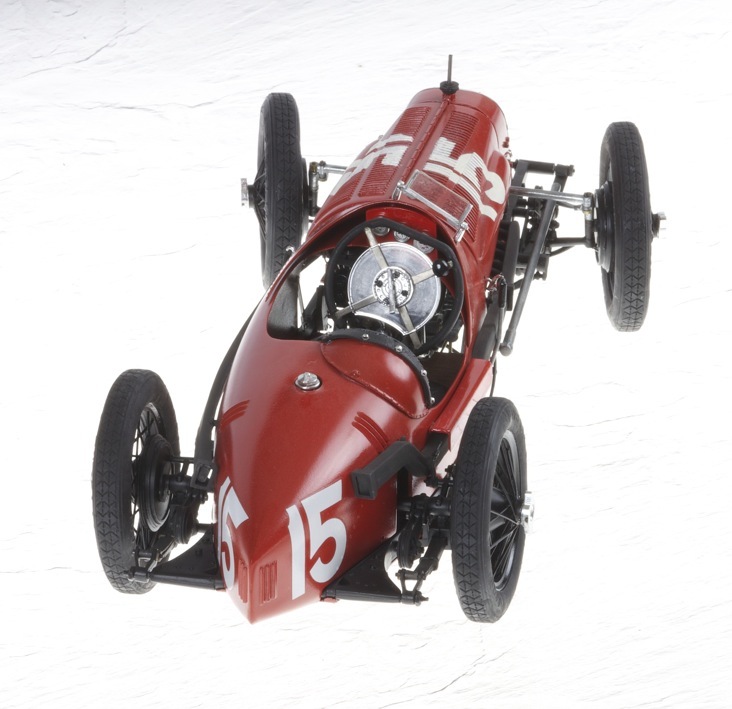 Formerly, the cars were two-seaters and supercharged, the latter characteristic remaining whilst single-seater cars became more common from 1926 with the new regulations. 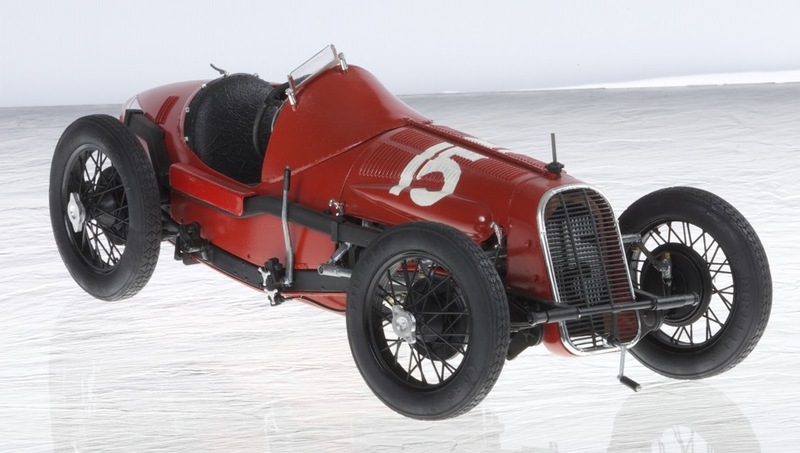 The Fiat 806 was raced just once in 1927 and thereafter Fiat destroyed their cars (804, 805 and 806) and withdrew from racing until their later association with Ferrari from 1969. This was a fascinating new experience to receive what is effectively a multi-media kit of the late 1980’s I presume, which I purchased from CarKits International. 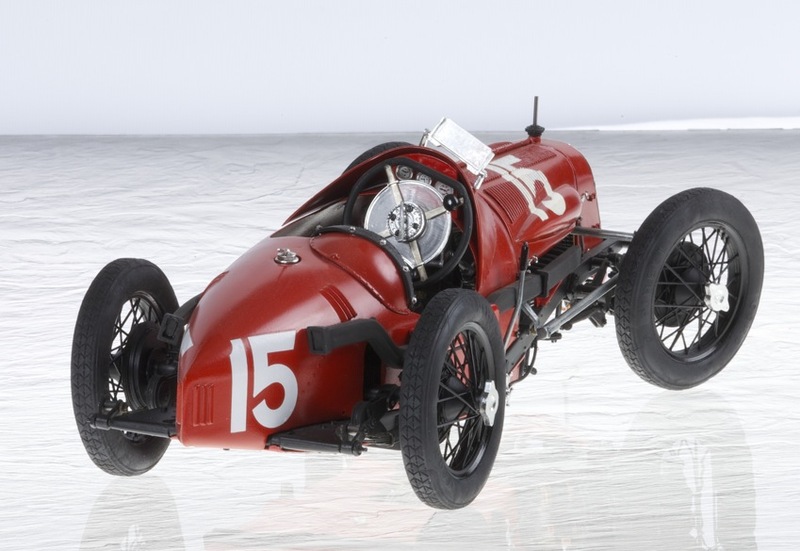 The owner Bob was able to source and subsequently sell to me a good number of then otherwise unobtainable 1/12 scale Formula One models (Tamiya principally) and Bob introduced me to this, my first Protar model. When I say multi-media, I mean multi-media as far as I was concerned and not to the degree that modern kits are, of the 1/20 range in particular. 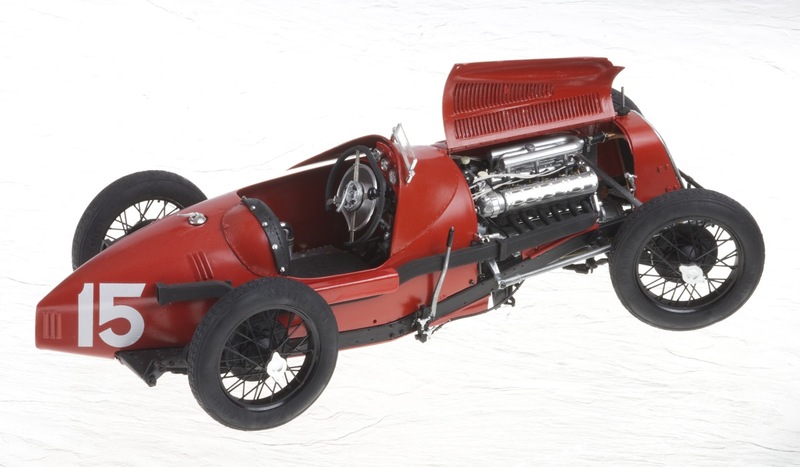 The Fiat 806 kit contained plastic parts, rubber tyres, wiring and a large quantity of metal castings including chassis longerons and the body itself. The completed model is heavy and vulnerable to damage to the quite brittle and rather too fine spindle on which each wheel rotates. Having cleaned up all the parts, which was just possible with my rudimentary equipment, it was a case of assembling the model with screws in many areas and the usual polystyrene glue. For the first time, I used automotive aerosol cans by necessity for the metal parts, over a primer which was easy and successful considering my total lack of experience. The leaf-spring suspension was supplied as individual strips of spring-steel which needed tempering (another reason to turn on the gas cooker in my bachelor accommodation) and quenching in oil ‘it said’, before assembling in groups and clamping together with small clips. The engine detail was good, although I enhanced it with improved wiring, hoses and jubilee clips etc. The steering wheel adornment, binding with cloth was difficult to make it look good, so I may have omitted to do this. The floor of the car was wood, so I used some wood veneer strips to improve this over the kit’s vinyl sticky-back plastic offering. The wheels to a certain extent required assembling from layers of quite well formed spokes which do not detract from the finished model. I had a go at spraying the race numbers through a template and the hinged engine cover with open louvres and retaining spring clips, were much appreciated details. I photographed the build in stages (then print film) and again one day, will have to seek out the negatives for scanning and digital presentation.